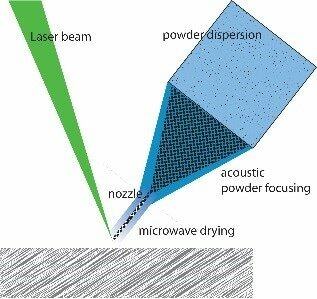 The most flexible 3D freeform manufacturing method is laser melting of a powder jet oriented onto a moving substrate. One example of such an Additive Manufacturing technology is Laser Metal Deposition (LMD). The obtained dimensions of the structures are usually in the millimeter to several tens of millimeter range. Smaller structures are presently limited by several factors including the applied laser spot size, the precision of the mechanical tables, the powder particle diameters (> 20 µm) of flowable powders and the powder jet spot size. The aim of the project is to find technical solutions for transporting small particle powders (< 10 µm largest diameter) at high rate to a spot smaller than 20 µm. The approach is to combine different processing techniques, in particular acoutic focusing, liquid jetting and microwave drying techniques, in a new type of powder focusing system. The system will be mounted on a deposition chamber with a laser focused to comparable spot dimensions (<25 µm diameter) in a 3-axis system guaranteeing the needed performance with respect to precision of better than 5 µm in all three dimensions.